These beauties will wow your guests but the big smiles will come after they take a bite! The sweetness of the fig with the melted goat cheese and the almost crispy prosciutto makes a fabulous combination for the perfect appetizer. This also goes great with a glass of red wine! Lay each fig on a the prepared baking sheet, spacing evenly. 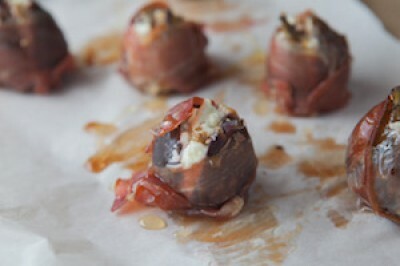 Drizzle each fig half with a slice of prosciutto then drizzle each one with honey. Remove from oven then lay on a bed or arugula. Then drizzle with extra-virgin olive oil and add a pinch of sea salt.